Fills all concrete floor cracks and holes for a high strength concrete repair. The pourable feature allows fast installation without specialized equipment. 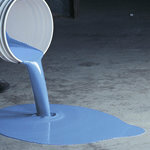 Forms a tenacious bond to all Garon floor coatings so that repairs stay in place. Chemical resistance for all industrial applications. Pre-measured components in a 1.5 gal kit for easy application. Components include: 1 gal Part A (resin), 1/2 gal Part B (hardener) - volumes approximate. Garon-Seal™ HCR is approved for shipping to all 50 states by ground or air.